If you went trick-or-treating as a child or do so today, you’ll likely remember the exterior decorations of a house that stands out above the rest. Hauntingly memorable Halloween décor puts it on the trick-or-treat map of all of the neighborhood kids, who, each year, can’t wait to see how the house will be decorated this year. In some towns, a benevolent resident with deep pockets may even go a giant step further, putting on a spectacular Halloween sound-and-light show at a frightful cost, attracting visitors from miles around. This works especially well if you have a motion-detector light on your front porch, enabling the entryway to remain dark and the eyes to glow until the trick-or-treaters walk up to your door…if they dare. Using the pencil, draw an “eye” onto each empty tube, making each a different shape, or trace an “eye” onto the tube using a template. 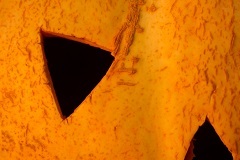 To find the best eye shapes, you could use a free pumpkin-carving template online, such as this one. Use the scissors to cut out each “eye” from the empty tubes. Bend the glow sticks, place one inside each tube, and then staple both ends of the tube shut. Hide the tubes in plants or shrubs near or along your entryway, arranging them so that the eyes face outward toward arriving trick-or-treaters. Your family and trick-or-treaters alike risk becoming spellbound. Cook the spaghetti on the stove, following the directions on the package. Drain the water from the pot, pour the sauce into the pot with the spaghetti, and continue to cook for a few minutes. When cooked, set aside enough spaghetti to fill one mason jar, and put away the rest to eat later for dinner. On each ping-pong ball, have your kids draw a small circle and then a larger circle around it, to represent the iris and pupil of an eye. To make the “eyes” look bloodshot, add red squiggly lines from the iris outward. Use the chalk to write a label for each jar: “Brains,” “Eyeballs,” “Truth Serum.” Pour the spaghetti and sauce into the “Brains” jar, put the ping-pong balls into the “Eyeballs” jar, and fill the “Truth Serum” jar halfway with water, adding a couple of drops of blue food dye. Put the lid back on each jar and screw shut. Display the jars on a small foldaway table or bench on your doorstep. Measure the width and height of the window or window pane where you plan to display the jack-o’-lantern, so that you know how much corrugated cardboard you’ll need to cover the window completely. Draw a face onto the cardboard that looks like a typical jack-o’-lantern pumpkin face, complete with triangle eyes, eyebrows, triangle nose, and jagged-toothed smile. Using the scissors, cut the eyebrows, eyes, nose and mouth out of the cardboard face. Affix the cardboard cut-out to the window, using the painter’s tape. Turn out lights in the house, but leave on the light in the room that displays the jack-o-lantern image. Boo!